We start our round-up this week in the county cup where it was a big Sunday of action for three of our sides in their respective county cup quarter final ties with them all just a couple of performances away from the biggest final of all. In the Essex Sunday Junior Cup, Dagenham United’s run to this stage of the competition has been excellent considering they entered into a competition above their league standing. This quarter final performance was blistering as they clipped Concord Rangers wings, sending the Sceptre League side spiralling to an 8-1 defeat. Dagenham will now face either Belfry or Barking & Dagenham Wanderers in the semi finals, that tie delayed after a postponement last weekend. The success continued into the Essex Sunday Junior Trophy competition where there were two clashes involving our clubs. Hornchurch Oakmont are another side who have really shone in this competition this year and they were up against Chelmsford based, Springfield Green, in their quarter final. Oak had a real Spring in their step and battled through to a 3-1 win to book their place in the semi final. And, remarkably, that semi final will be an all-Corinthian affair as Royal Albert assault on five fronts this season shows no end as they played host to Braintree & North Essex Sunday League side, Notley Reserves. In a very tightly contested match between two well matched sides, a Royal Albert set piece proved the only thing could separate the teams as they won through 1-0. Those results therefore confirm a guaranteed Corinthian finalist in this season’s Trophy final for the second year running after Upshire’s wonderful victory last year. We look forward to following whoever that finalist may be on Friday 5th April at Aveley FC! Fingers crossed for the same outcome in the Junior Cup too. The Premier Division Cup saw two exciting quarter final contests on Sunday with four sides vying for a place in the semi finals next month. In one of the games of the day, the league leaders, Repton Park, were up against one of their big rivals this season in the shape of El Valiente. The latter made their home advantage count as Sam Edwards scored a hat-trick along with Kane Malone, Ricky Field and Ash Lee getting on the scoresheet. Charlie Henry and Alex O’Neil were the Repton scorers in reply in a 6-2 scoreline. Joining El Valiente in the semi finals of the competition will be FC Mexico who caused a bit of a shock against the present cup holders, Romford Elite, sending their local rivals to defeat in Emerson Park. Mexico put aside some indifferent form in the league in recent weeks to earn themselves a 2-0 win that puts into the last four, hosting El Valiente. The cup quarter final action continued into the Division One Cup where one tie survived the deluge of wet stuff with Korona Redbridge taking on co-tenants Valentine United in the Barkingside derby match. A close contest finished level at 1-1 after ninety minutes with Chris Blohm and Dawid Smolarek on target. Dawid scored again in the extra thirty minutes for Korona to finally pull the sides apart and win it 2-1 for the hosts. In the Division Two Cup quarter final, there was a similarly tight contest down at Castle Green where Bretons Manor were the hosts to a revitalised Walthamstow Avenue side who were hoping to turn their season around. Avenue’s Bradley Donovan and Manor’s Greg Bowles scored to see the sides finish level at full time. But in extra time, Stefan Campbell was the hero, netting the winner to see Walthamstow Avenue over the line in a 2-1 win. Back into domestic action, there was just one game in Division One that survived the elements but a big one that affected both ends of the table with Westferry Elite seeing their stay in the second tier ended as they went down to top of the table SL Menfica in a 3-1 result. David Hornsby scored twice and Thomas Rice once to see the leaders move three points clear with two games in hand. Six points from their remaining matches should see SL over the line for the title. Over in Division Two, there was a battle royale between two close rivals as Ferns Seniors and Goresbrook went head-to-head in the Warren derby match in Chadwell Heath. An exhilarating contest of six goals saw George Evans, Daniel Lohan and Liam Coney scoring for Ferns, the latter against his old club. But Goresbrook just wouldn’t give it up and levelled from strikes from Jack Parlour, Charlie Barrett and Stephen Butterworth to end it at 3-3. In Division Three, the big game on the day saw Central Colts looking to move closer to a second successive league title as they travelled to Walthamstow to face familiar opposition in the form of E4 Rangers. Colts goals from Donavan Reynolds, Liam Mulcare, Kelvin Malcolm, Tunde Olagunju, Jake Nelson and Dilland Stephenson were too much for E4 who responded through a Tim Dye brace and a Charlie Perry goal in an eventual 6-3 scoreline. 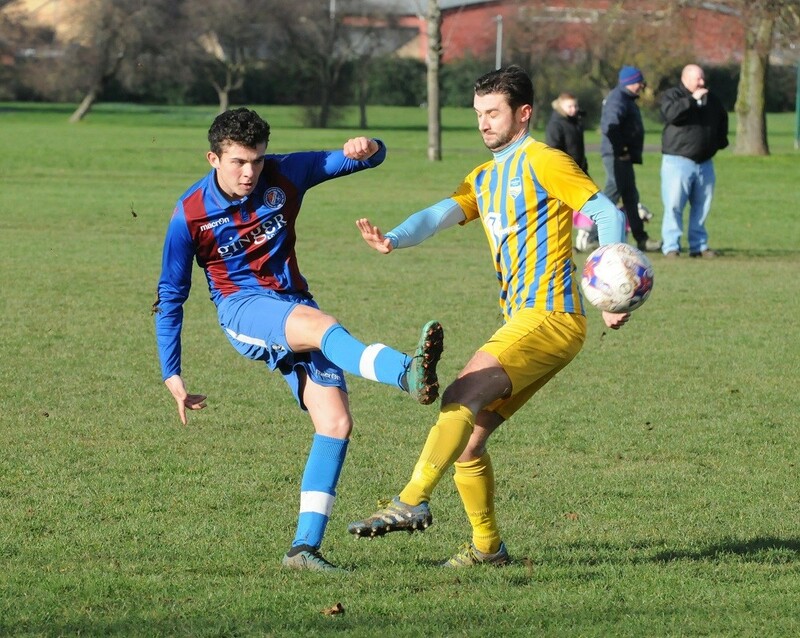 Third placed Alpha saw their promotion credentials take a blow as they were held at Castle Green to a 2-2 draw away at Dagenham United Reserves at the weekend. Timmothy Clutterbuck resumed his goal scoring for the Daggers with a customary brace with Conor Wallace and Kai Brown scoring in reply for Alpha to take a share of the spoils. Roneo Colts are making a second half of the season dash to be considered for promotion and are now up to fourth place in the table. They took on Ping City Phoenixes once again after an epic cup tie against them a few weeks ago. Colts made no light work of this latest encounter with James Pottle scoring a hat-trick and further goals arriving from Sam Baohua, Charlie Dann, Charlie Dow and Tommy Harber as Colts secured a 7-0 victory. It was a big morning in Division Four where top played second as Newham Athletic looked to make it a double over Woodford this season. Kane Green scored twice for Newham with James Field, Caelan Kellegher and Aaron Alison all netting to see their side run out as 5-2 victors. Nothing is ever over until the proverbial fat lady is singing of course, but Newham look good money to be lifting the silverware this season. The main battle now looks to be the race for promotion and this could go to any of three or four sides still depending on the run in for those clubs. East Ham Inter are third and in some decent form presently, aided by their most recent win, a 6-0 victory over Alliance United. Delphin Xavier and Kulbir Singh both scored twice with Alex Ceobanu and Harinder Sanghera getting the others. Lurking just outside of the top three but with games in hand that could prove decisive are Asianos Reserves. They continued an excellent campaign thus far with a big 6-1 win away at Grey Area on Sunday. That was their eighth league win in thirteen this season and they could move up to second with their matches in hand. Remaining sixth placed in the table but still with a very big say on what happens above them, Monkhams picked up a sixth league win on Sunday as they hosted ninth-placed Custom House Community in Loughton. Sam Snell and Cameron Perryer got on the scoresheet for the hosts with the goals in a 2-0 victory. Last but not least, as contests go, few would better the eight goal thriller between AC Milano Reserves and Oak Royals which took place in West Ham, the sides locked in seventh and eighth place respectively in the standings. But it was the hosts, AC, who will have gone home the happier of the sides in the end as they ran out 5-3 winners on the day to pick up a fourth league win.